While waiting for a replacement oil line part from Germany to arrive, I decided to drop the engine and deal with a few other oil leak issues, valve adjustment, repainting the tins.... you know how the slippery slope goes... but I did not see any reason to pay a premium for replacement bolts and nuts for the covers and mufflers etc. I went looking back at a few old posts on getting replacement nuts and bolts, tried a few of the links and became frustrated with the ordering process of the suggested vendors. I then tried www.nutsandbolts.com (No affiliation) who have an online shopping cart and came up with the below list... but they don't appear to sell bolts with the cadmium coating, just zinc. I have not purchased these yet. The ones below are all 8.8 (except the stainless). Other than Ace Hardware, where do you guys buy replacement nuts and bolts? I was thinking it would be cool to have a nuts and bolts replacement kit for our cars. And I also buy various Viton O-rings and odd ball stuff from them on occassions. I buy most of my nuts and bolts at my local hardware store. I sell fasteners for a living, not selling here, though. All of these parts are readily available, however, when you need just a few of each the price multiplies dramatically. I probably pay $14/1,000 for a steel zinc plated M6 hex nut. You pay dearly for someone to bag just a few and keep them in stock. Hardly anyone will plate with cadmium because it is known to cause cancer. Ironically, the largest user of cad plated parts is the US military. Zinc plating has been bastardized by the European market (so the USA can meet ROHS compliance). Classic zinc plating contained hexavalent chromium (think Erin Brokovich) which has been changed to trivalent...what you will see is your standard steel zinc fasteners will rust sooner than before, but there are less toxins in our landfills when they are discarded. Buy fasteners where you can get them, stick them in styrofoam and paint the heads with Rustoleum. That will be your best way to prevent rusting easily... or pay for stainless where strength is not critical. My 2 cents worth, or in this case an M6 zinc hex nut! Thanks Guys... All good advice. I did not know about the cadmium thing.. thought that was the only way to get the gold color bolts. Our local ACE Hardware has most bolts in stock, but they will run 35 - 60 cents a piece. I just placed an order at mcMaster which had a wider selection. Incase anyone is interested, here are the part numbers that are pretty typical on our cars. The only one I was not sure about were the set screws for the muffler... a bit of a gamble there. Most "gold" hex bolts are plated with zinc dichromate. The main reason this is used is to quickly distinguish a grade 8 bolt (yellow) from a grade 5 or 2 (both silver). I am glad McMaster worked out for you. It is like a candy store for many odd-ball hardware bits & pieces. I recently found another source. I see their building on my commute to work each day. I haven't used them yet but they seem to have a wide selection. Similar to tgage, I'm not adverse to buying a few nuts and bolts from Porsche to use when doing a job on the 964. But when I was quoted over £6 for a captive nut and £4 for the bolt to go in it....I thought enough was enough. 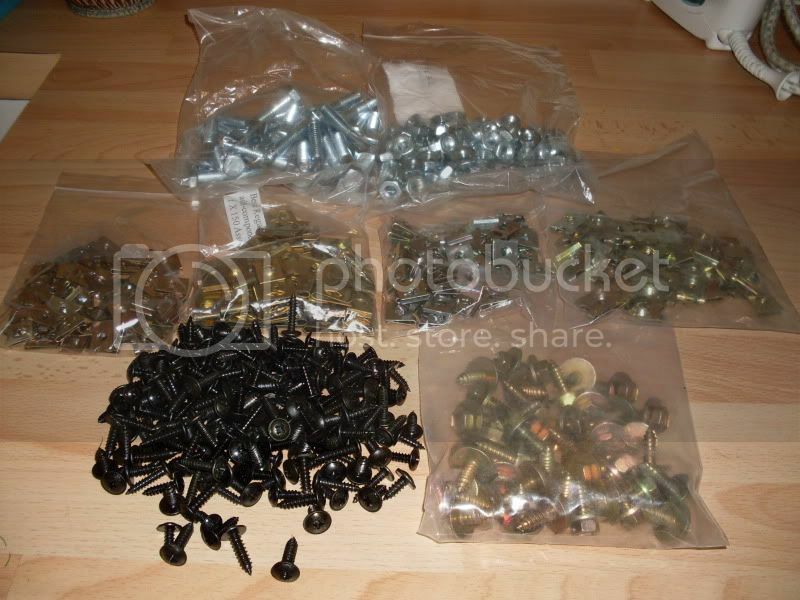 A quick search around ebay and the web saw me acquire a ruck of u-nuts (spire clips), bolts, lock nuts, self tappers (hex head and posidrive) for the price of 8 Porsche captive nuts! Well it took a spam post to revive this thread but I’m intrigued at the real posts. This is a real pain when doing something like a full engine rebuild. i bought almost everything from EBS Racing. They were quite reasonable and recall paying 50 cents for copper hex nuts for the exhaust vs... $5.00 locally !! overall cost i found reasonable. but did not get the $14 / 1000 price. I purchased a lot of fasteners from BelMetric. RM European has reasonable prices on some very specialized bits, then there are some I just see my local Porsche dealer parts guy. He's been very helpful. All times are GMT -3. The time now is 02:08 AM.